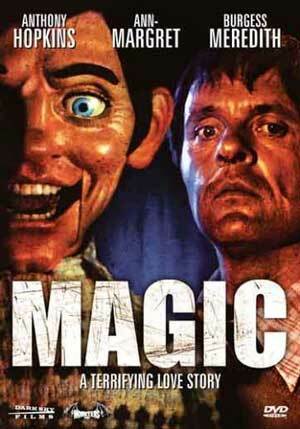 Those of you who were disappointed in this year’s most recent killer-ventriloquist-dummy-horror movie, “Dead Silence”, might be interested in checking out “Magic” starring Anthony Hopkins which was recently unearthed on DVD. Much more of a psychological thriller ala “Psycho” or “Rosemary’s Baby” and less of a gratuitous “killer toy” movie like “Child’s Play” or “Dolls”, “Magic” actually tells a very unnerving and engaging love story with a very solid cast you wouldn’t expect to see in a movie such as this. Corky Withers (Anthony Hopkins) is a ventriloquist who’s moving up in the world of show business thanks to his manager, Ben Greene (Burgess Meredith). However, Corky is a bit too attached to his loud and crass dummy, Fats (voiced by Hopkins), and when he is required to take a psychological exam before taking a television contract, panics and flees to his old home town. He takes up residence at a lakeshore motel run by his old high school crush, Peggy (Ann-Margret), and the two immediately hit things off. However, Fats’ personality begins to dominate Corky’s and he views Peggy as competition. Corky undergoes even greater psychological stress when Peggy’s violent husband begins threatening him and Ben Greene tracks him down, determined to get to the bottom of his mental disorder. Corky eventually snaps from the stress and under Fats’ guidance, deals with his problems one after another. For a movie that typically gets relegated to the silly horror movie bins alongside “Rock and Roll Nightmare” and “Troll 2”, “Magic” has an incredible cast. You’ve of course got the likes of Anthony Hopkins in the lead role, back before he really hit it big. But you’ve also got then-bombshell Ann-Margret and the ever-talented Burgess Meredith filling out the ranks. The all-star cast alone should tell you that this is more than some goofy movie about a killer ventriloquist dummy. “Magic” is a psychological thriller at its core. Fats is never actually “alive” in the sense that his dummy-body isn’t animate; he exists only within Corky’s delusional mind. It’s rather similar to an episode of The Twilight Zone (“The Dummy”) in a few ways, so if you recall that popular episode then you might have an idea of how this movie was handled. While Fats is never actually alive, Hopkins delivers such a strong performance you actually find yourself forgetting he isn’t at times. Despite being an inanimate doll, Fats truly steals the show in this film. It’s amazing how frightening he can be. He never actually moves on his own (save for one scene where the dummy operator screwed up), yet he becomes such an entirely separate character from Corky, that you discover yourself finding Fats scary and Corky not, despite them being the same person. “Magic” provides some very tense and memorable sequences. My favorite is the scene where Burgess Meredith tells Hopkins to shut Fats up for five minutes. The movie then moves along in real time as Hopkins nervously tries to keep Fats quiet. A very uncomfortable sequence done extremely well, to Oscar-winning Director Richard Attenborough’s credit. If you’re in the mood for a wacky horror flick about killer ventriloquist dummies then you’re not going to find it here. However, if you’re in the mood for an extremely well-crafted and well-acted psychological horror film then you’ve come to the right place. “Magic” really delivers and belongs on every cinema fan’s shelf.